On Tuesday, 6th October, District 10 Bar & Grill had its grand opening for its newest restaurant at Suntec City Mall. I managed to pay a visit prior to the grand opening to see what it was all about. 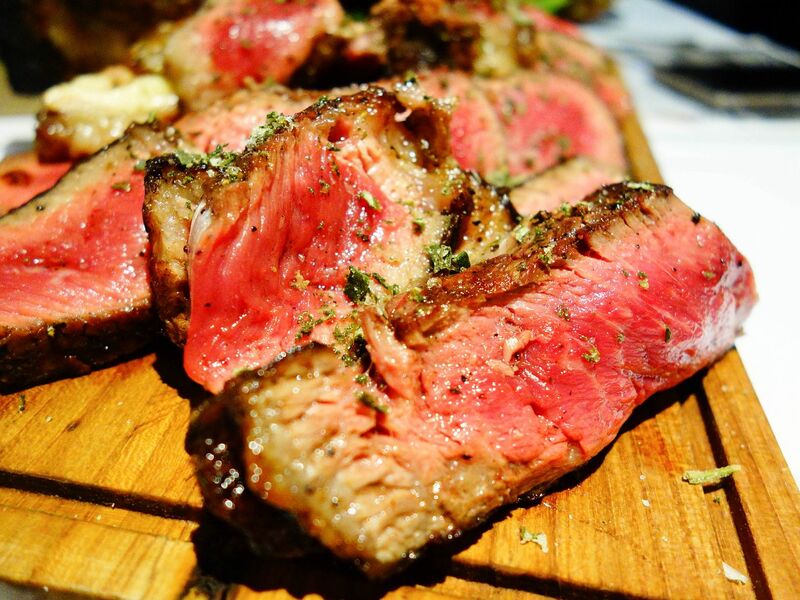 The outlet at Suntec City specialises in dry-aged meat. 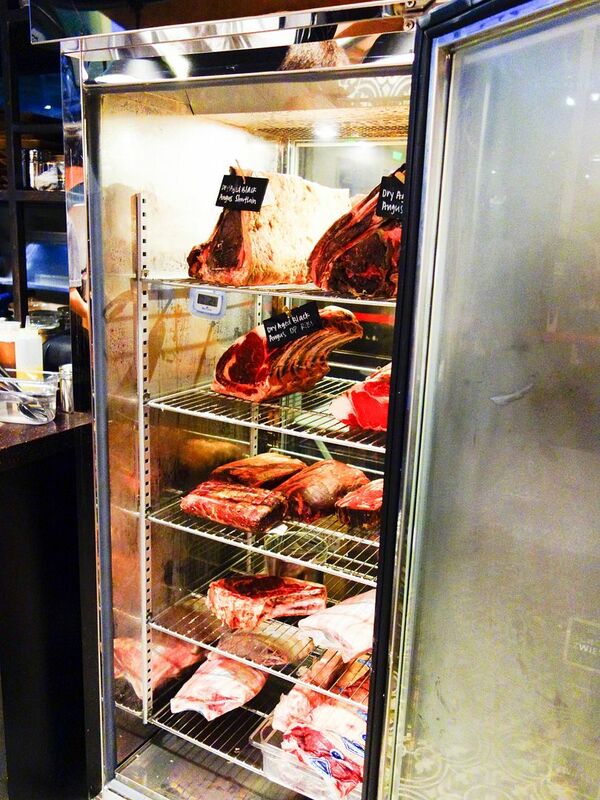 Some people might ask what’s so special about dry-aged meat. I can tell you that dry-aged meat can be a bit pricey but the price difference is definitely worthwhile. 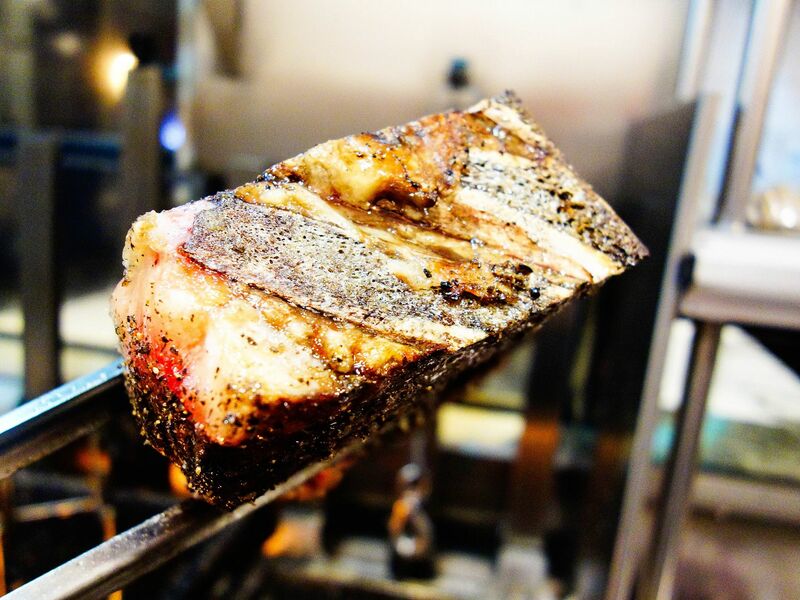 Once you’ve tried dry-aged meat, it’d be hard for you to try anything else. 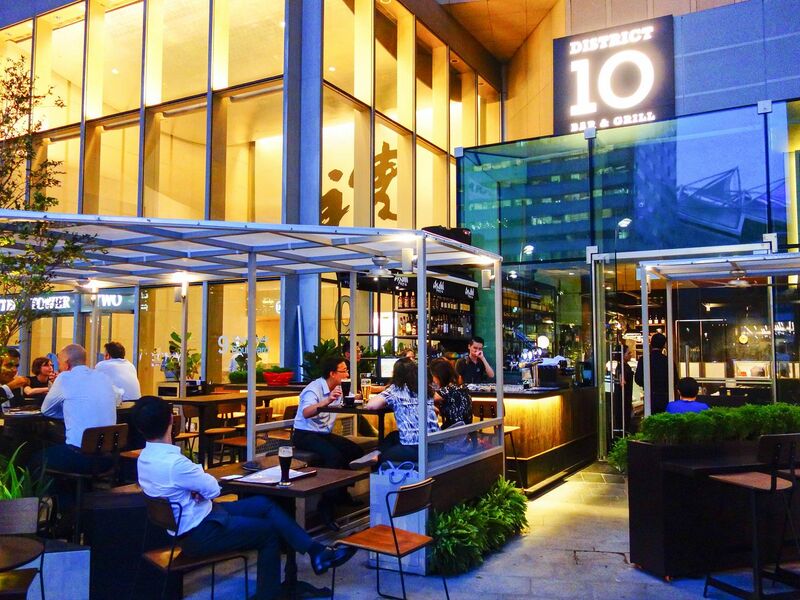 It is worthy to mention that District 10 Bar & Grill is the first restaurant with an alfresco seating area in the whole of Suntec City Mall. The exterior is stylish and inviting while the interior exudes sophistication. The small and cosy 1,800 sqf establishment is ideal for an after-work chill session or a dinner date. This refrigerator costs a whopping S$20,000. They must be serious about their steaks! The process of dry-ageing allows the meat’s enzymes to break down the fats, proteins and carbohydrates into flavourful sugars, amino acids and fatty acids. Also, dry-ageing the meat causes it to lose moisture hence the meat tissues and flavours become more concentrated. There’s a lot of science involved and it can get confusing but I will let the pictures do the talking. During my visit, I was privileged to meet Chef Luca Pezzera, co-owner of District 10 Bar & Grill and a native of Bergamo, Italy. He was able to show me how the restaurant prepares and grills the steaks to absolute perfection. 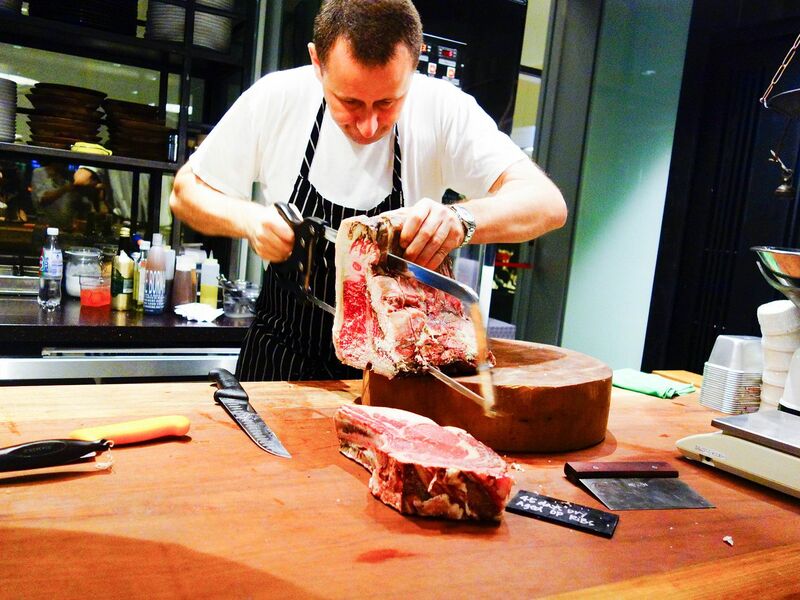 Chef Luca Perezza skilfully carving the meat. 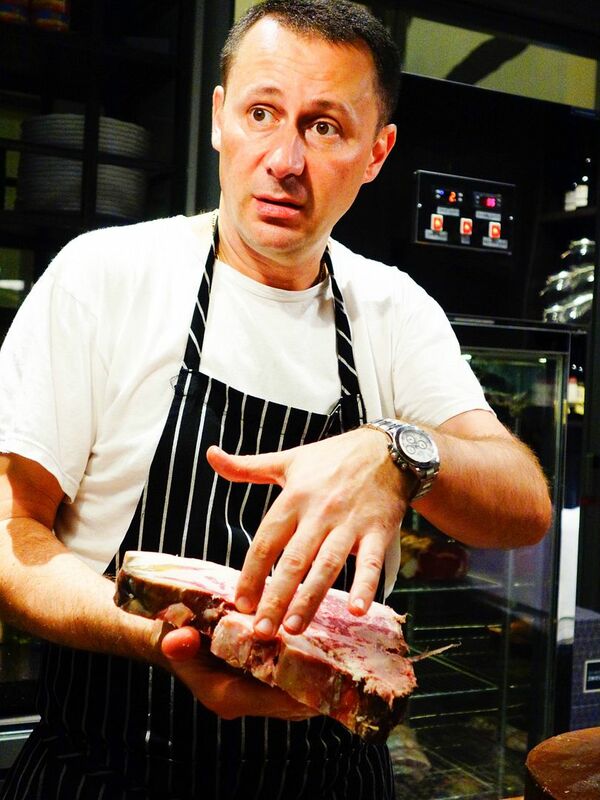 Chef explains the superiority of dry-aged meat. 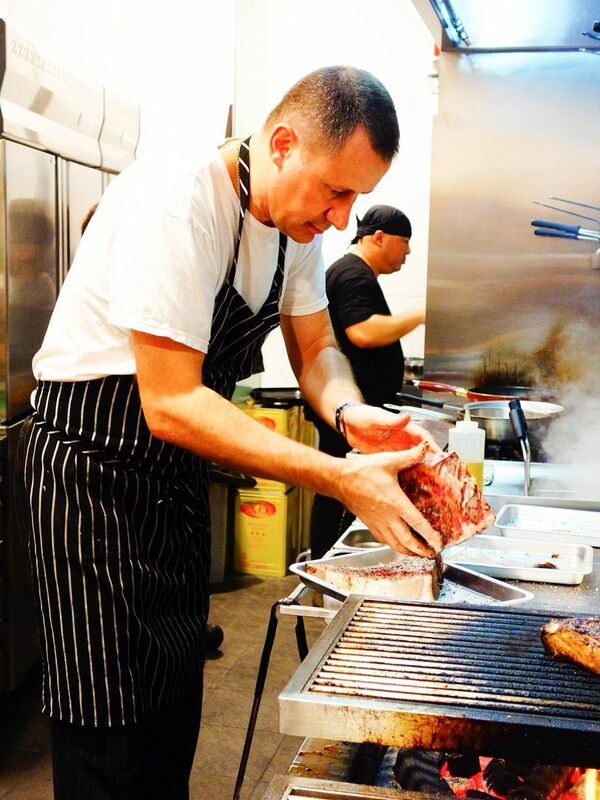 Chef prepares the meat for the grill. 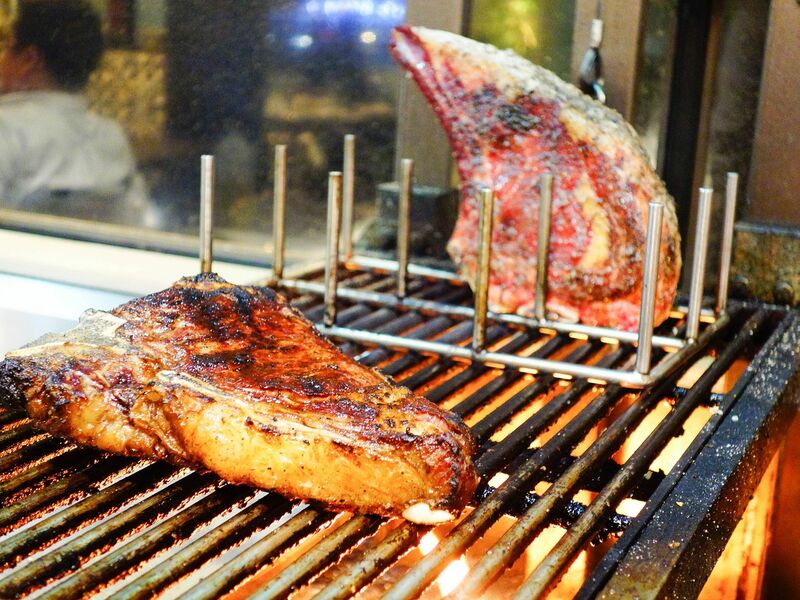 The grill set-up was impressive with the ability to adjust the heat by controlling the height at which the steak sizzles above the flame. 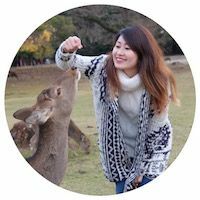 The grill uses only high quality Japanese charcoal, which does not vent smoke or undesirable odours that would affect the taste of the food. 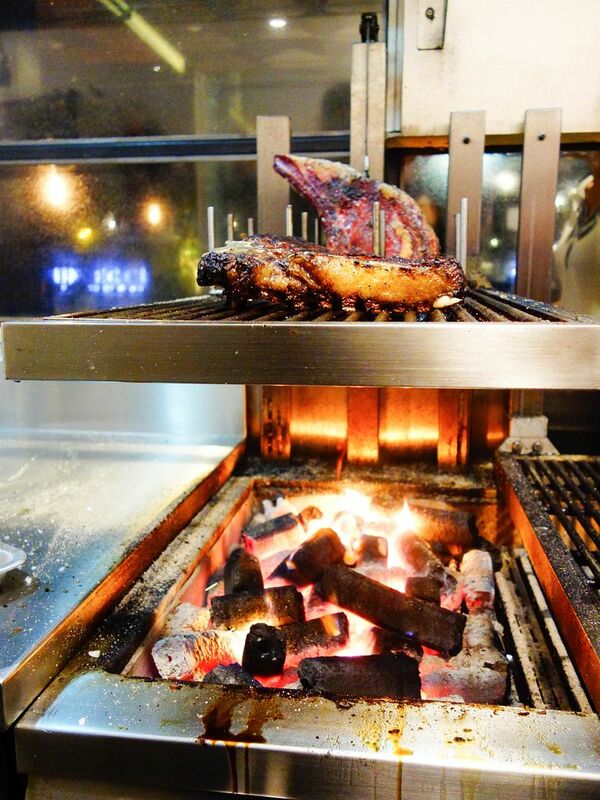 Check out those yummy sizzling juices near the bone. 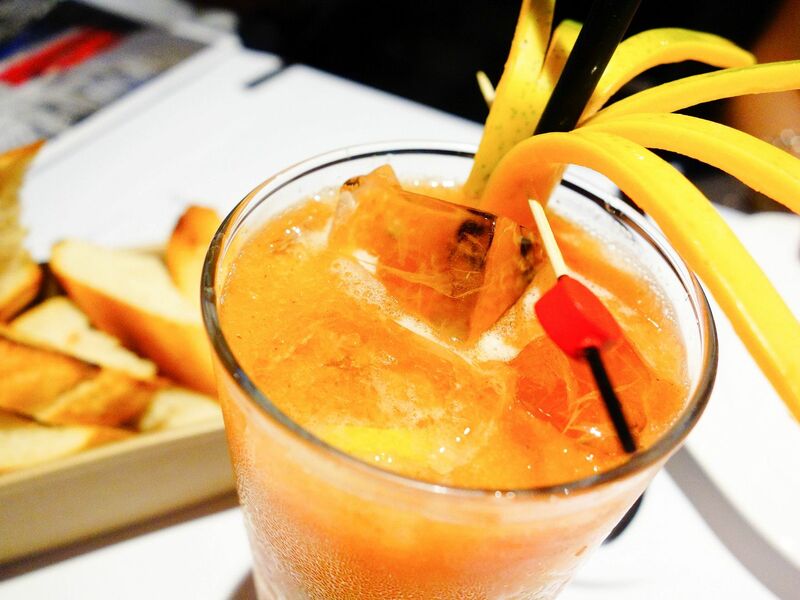 To begin my meal, I had a signature cocktail that is exclusive to their Suntec outlet, Fruits of Angel. It’s a tropical mix of Plantation Original Dark Rum, homemade papaya syrup, fresh lemon juice and thyme served in a highball glass. I found it a refreshing fruity beverage that gave me that little buzz. I am no alcoholic but I had two glasses of it. 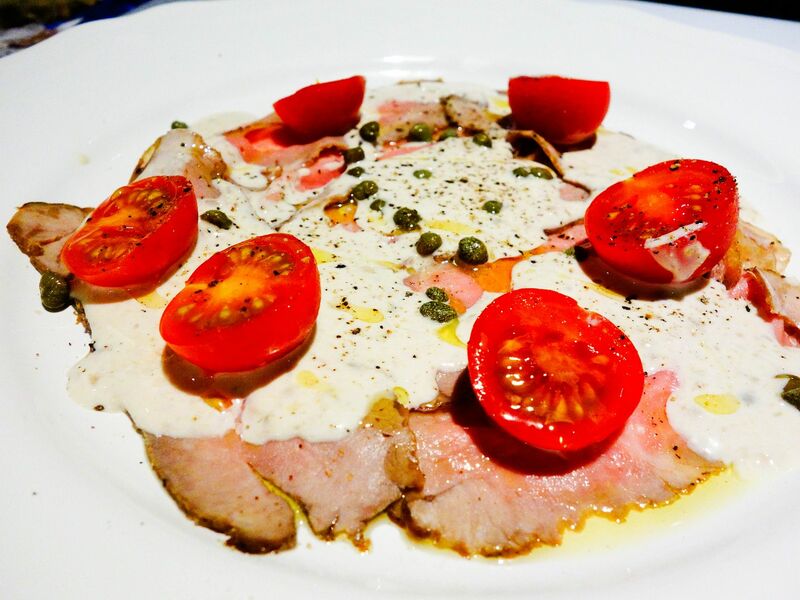 Vitello Tonnato is a northern Italian dish of sliced veal with a light tuna sauce. In spite of the odd sounding combination of veal and tuna, this appetiser was surprisingly delicious! District 10’s rendition uses thinly sliced veal which is then roasted and also topped with beautiful sweet cherry tomatoes. The tuna sauce is subtle and does not overpower the veal nor the palate, which makes the veal and tuna a stunning combination. Burrata is made from mozzarella and cream and it is a cheese that I simply fell in love with when I first had it in Italy. 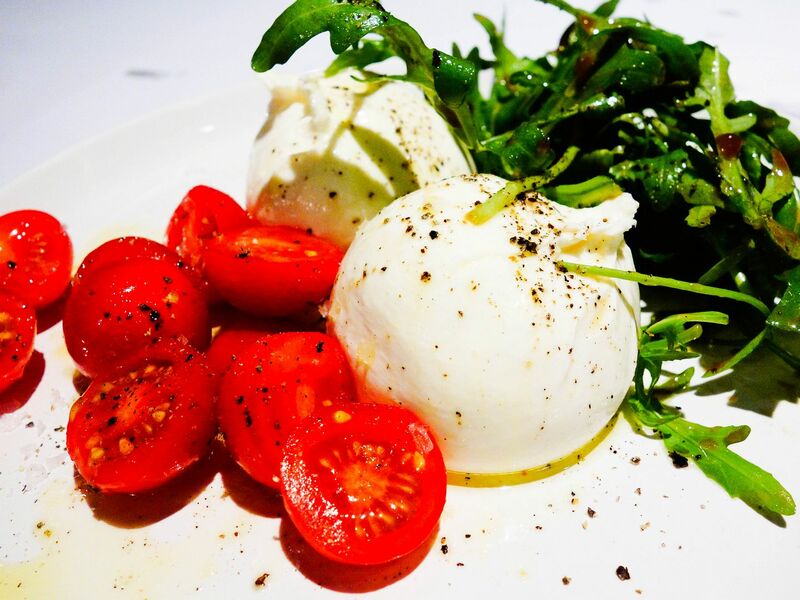 The two soft dollops of plump burrata were accompanied by sweet tomatoes and fresh salad rocket leaves. Once I sliced open the mozzarella casing, the thick and luscious cheese and cream simply oozed onto the plate. Within one bite, I could taste the rich, milky and buttery goodness of the burrata. 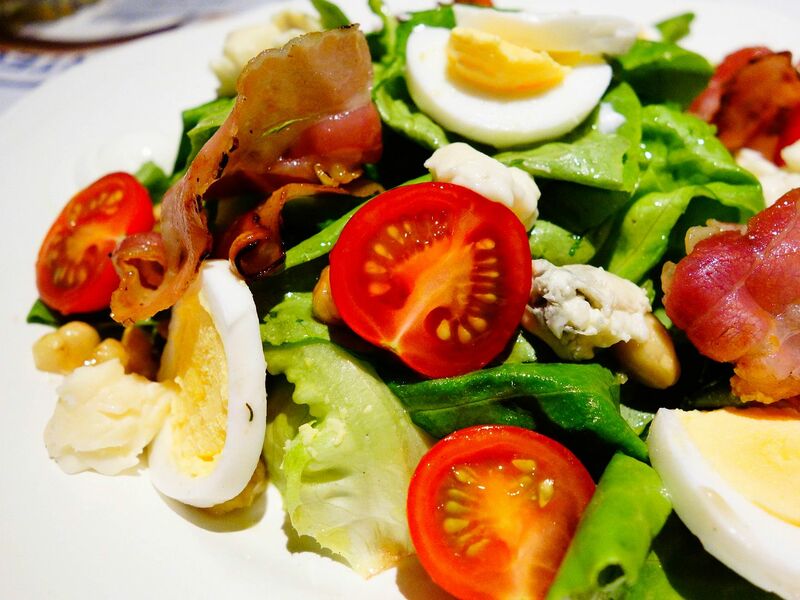 This was a simple and light salad that was refreshing yet tasty. I have to admit that I was rummaging the salad for the wonderfully fried pancetta slices and the dolce gorgonzola bits. The Italian blue-green cheese was not as strong as I imagined, which is ideal for a salad. The organic cherry tomatoes were imported from Australia and they were probably the best cherry tomatoes I had in my life. I kid you not. 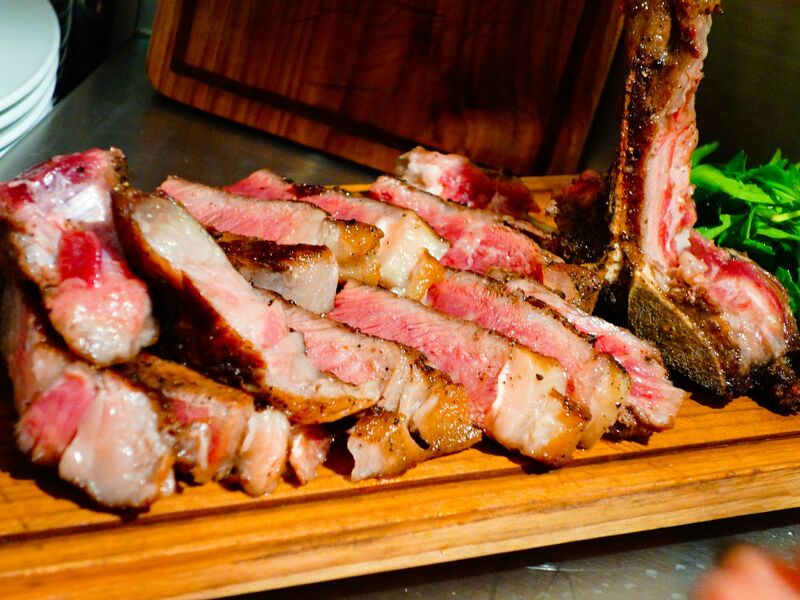 Fiorentina steaks are also known as porterhouse or T-bone steaks. They consist of both the tenderloin and striploin with the T-bone right in between dividing the two. 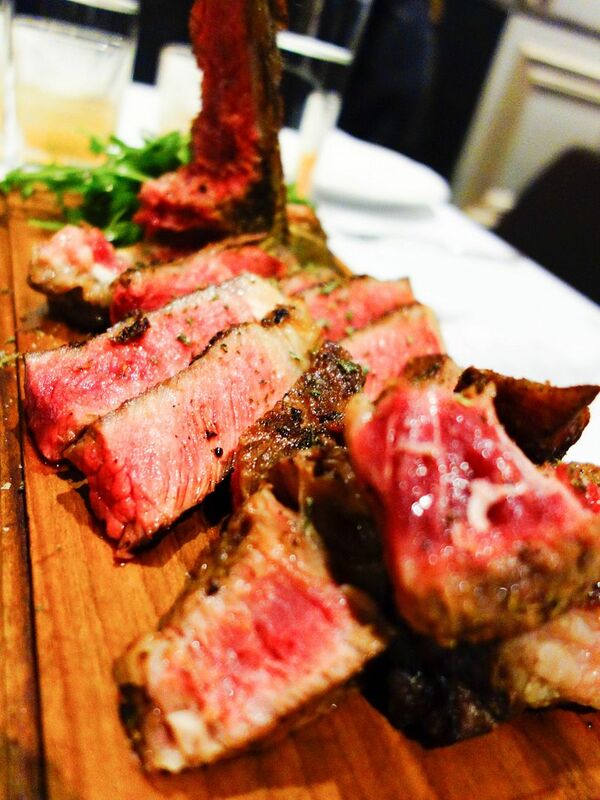 The fiorentina steak was sliced thicker than the OP rib and I also found that it had more fats, both of which I love. Which steak should you order? Well, I don’t think you can make any mis-steak (haha) here as they’re both good. Not that more expensive means better but in this case, it is. My preference would be the fiorentina steak as it had more fat content which was just more shiok to sink your teeth into. Also, to have thick (but not too thick) slabs of tender steak that was easy to cut and chew was great as well. 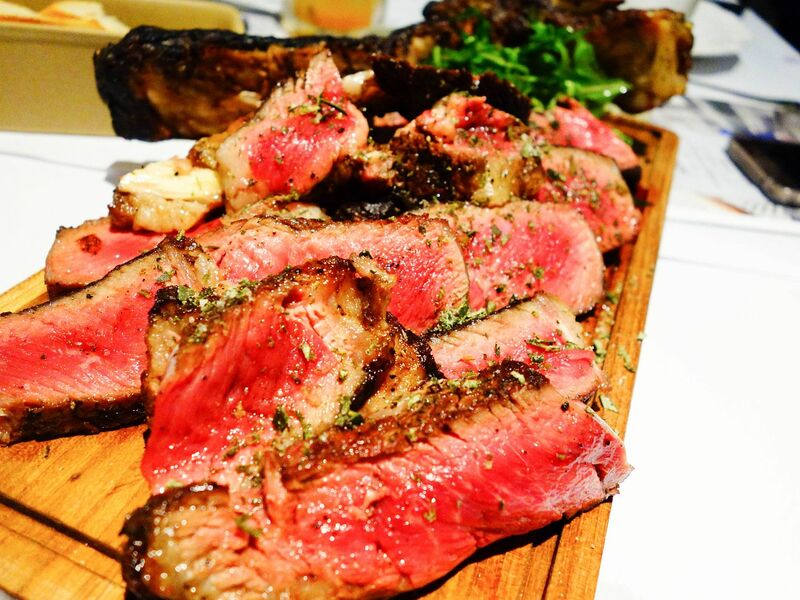 Chef Pezzera insists and recommends that the doneness of dry-aged steaks should be medium rare. Though the insides may appear red, it is not bloody and it is also completely warm. This dessert tastes as amazing as it looks. 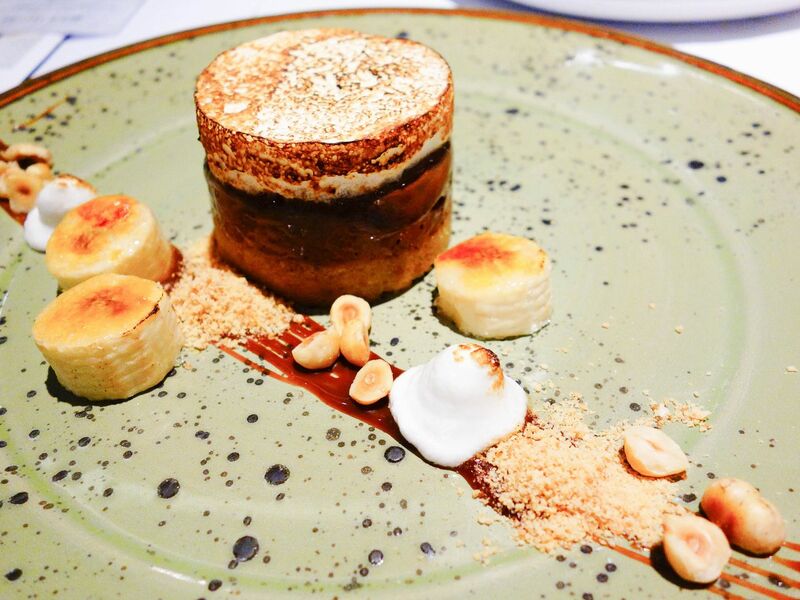 As I took a spoonful of the cylindrical dessert, I could feel the varying densities of the soft fluffy marshmallow, the bitter chocolate, the sweet banana caramel centre and the graham cracker-like crust. As I took a bite, those different elements were distinct in taste and textures but yet they went so well together. I usually don’t order panna cottas because not many establishments can do them well. I was, however, really impressed by Pastry Chef Gerald Chua’s creation. Appearance wise, the panna cotta just barely holds together as it jiggles, which is the perfect consistency. The coffee flavour had the right acidity which provided a pleasant crisp taste that helped to remove the iron taste from all the meat during the main course. 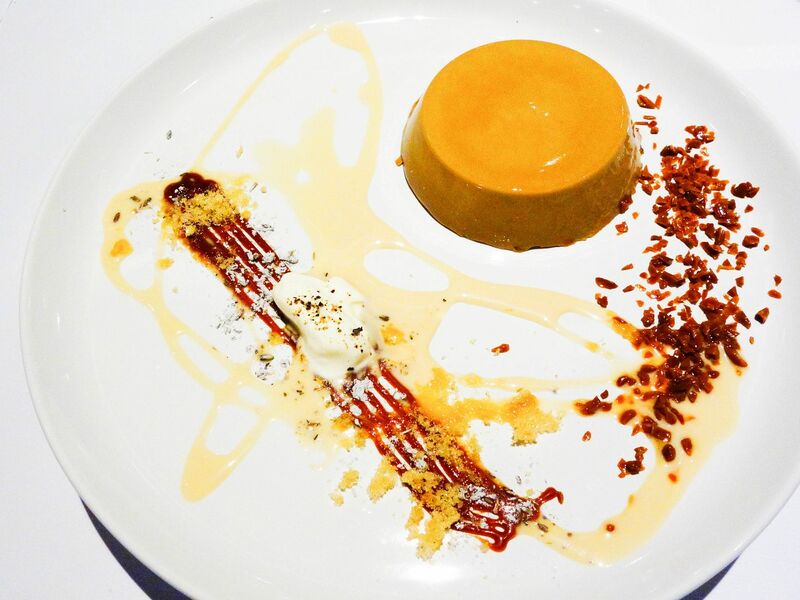 Also, the sweetness of the vanilla sauce and caramel crumble balances the slight itterness of the panna cotta while the tinge of lavender soothes and adds a refreshing edge. At the end of the meal, I was immensely satisfied. The service was exceptional and so were the dishes and cocktails. I’m definitely in trouble because I am now spoilt by dry-aged steaks and it would be hard for me to try any other. 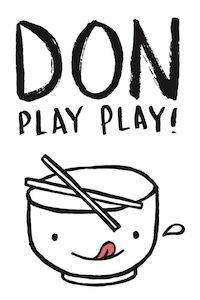 As mentioned, though the menu is pricey, you are getting your money’s worth. If you're looking for a great night out or a place to celebrate a special occasion, I will highly recommend District 10 Bar & Grill.